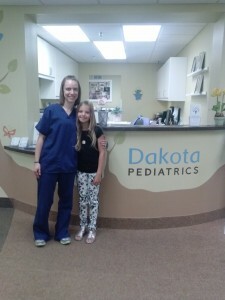 I chose to serve Dakota Pediatric Clinic as one of my service projects. My brother has been a patient for 17 years. I have been a patient for 9 years and my sister has been a patient for 7 years. I was trying to think of a way to help them out since they have taken such good care of us. So, I came up with the idea to volunteer to sanitize and clean the whole clinic. From sanitizing A LOT of toys to door handles, cabinets, chairs, video game controllers, exam rooms, desks, counter tops, sinks, toilets and bathrooms, I don’t think we left that place with a germ! Even the windows and glass doors were cleaned. The staff was so thankful and appreciative, I was glad I could give back! I had asked how often the staff had to sanitize the waiting room and they told me daily! That makes me feel good though knowing they are preventing the spread of germs from patient to patient. Dakota Pediatric Clinic is located in Inver Grove Heights. It was founded by Jane VanRoekel (who I miss) and her husband in 1984. Dr VanRoekel’s son Robert Deeb currently operates the clinic.